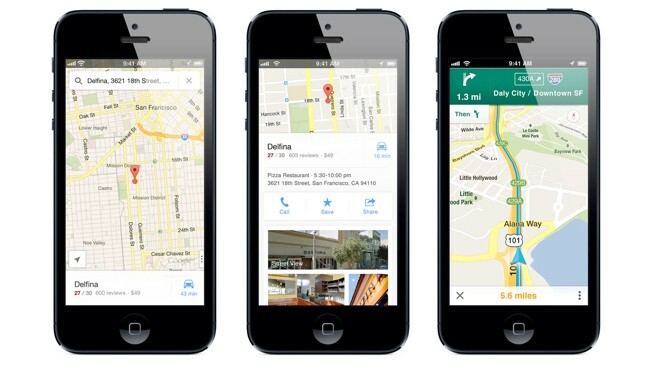 For those of you that have been disappointed in Apple Maps for the iPhone 5, last night, Google released the much anticipated Google Maps app. Nokia released their Nokia Maps app a while ago, which felt rushed to the market. The new Google Maps isn’t like the old built-in maps app that Apple had before. The new version was built from the ground up by Google, which probably feels similar to what’s on Android. The navigation app offers turn-by-turn navigation, street view and traffic. Google has opted for a side sliding drawer that lets you select traffic, public transit and satellite views. The gesture-based UI also lets you tap and hold to drop a pin and then swipe up for additional information about that location. You can share, save, navigate and view street view information from this screen. A two-finger swipe across the screen will tilt the map giving you a 3D view of your location. Overnight it has also jumped to one of the most popular free apps in the Apple App Store! You can download it from your phone, or view it in iTunes from here.